I get this error trying to mount a Ram disk under Windows. Any clue how to handle the problem? What is your operating system version? This is a known issue for 32 bit. I keep getting this C000009A error code when I add a disk. I am running Windows 7 32 bit. My system is Win XP SP3, 3GB RAM. I get error C000009A if the sum of the sizes of my 3 ramdisks that I create is larger than 616 MB. My disks are: 1st - 256MB, 2nd - 256MB, 3rd - 104MB. If I try to create 3rd ramdrive with size larger than 105 MB, I get error C000009A. Apart from this limitation SoftPerfect RAM Disk runs beautifully. I was getting the same error with my 10752MB RAMdisk: "One or more volumes could not be mounted. Operation failed with status code = C000009A and image status code = Image load succeeded"
I wonder if it's related to the Free RAM reported in Task Manager, as I got the error and was unable to mount the RAMdisk when Available RAM was plenty (13-14GB) but Free RAM was lower, maybe 6GB or less? Then I mounted a 10GB RAMdisk OK in IMGDisk and after dismounting it, Free RAM was much higher, around 13-14GB. I then tried mounting the SP RAMdisk again and it worked OK.
xp sp3 32bit. 4GB Ram. when i mount ramdisk lager than 325MB Error C000009A occurs. Windows XP SP3, 3 GB RAM, Not sensitibe to file system or raw; or other options. It seems to have a size limit issue. Disk/Add 300 MB works, 360 and larger gets subject error code, and "Unknown reason". I get the Error C000009A too, when I'm trying to create a bigger Ramdisk (tested up to 250MB that worked). I have Win7 SP1 x64 with 32GB of Ram. I've only tried to mount a small disk (150 MB), but still get this error in Vista SP2. "0 the operation completed successfully"
First time user, switching over from another RAMDisk software. I made a few 8MB disks by mistake, had no errors then.Then I got this when I tried to make 8GB disk. On what system (Windows version and bitness) are you receiving this message and how much RAM have you got? It's a Win7-64 box, with 24GB in triple channel (i7-990X); It would come up if asked for a drive of 2049 or lager. 2048 worked perfectly, creating and deleting at will, which is what the documentation led me to believe was normal behavior. But it's probably a moot point: While I've gotten a couple of errors like that, and a few "unable to dismount" to go along with it, it seems all I had to do was reboot, and the drive (and memory usage) I was expecting where there! I am also getting this error. Win 7, 64 bit SP1. Acer laptop i5 3230M, 12GB RAM (1 8gb + 1 4gb stick). Pagefile = 1024MB. I use another program called PrimoCache and whenever I try to create a L1 ram cache larger than 2048 MB, I get an error that there is insufficient memory available. I am happy to send you a log of anything you need to help to fix this issue. I love SoftPerfect RAM disk and will be glad to help. Is there some kind of debug mode where we can generate a log of the program performance? I have no clue if it is the pagefile, windows telling SoftPerfect that there is less ram that is really available? It appears there's something not quite right with the system. If both PrimoCache and the RAM Disk fail to allocate more than 2 GB, then it's apparently a system-wide issue. Please post here a screen shot of the System Information\Memory from Process Explorer or at least Performance/Memory from the Task Manager. I also recommend to increase the pagefile's size to the amount equal to the installed RAM's size to see if this fixes the issue. The same thing with me. After I rebooted, the 6gb ram disk drive was available for use. Not sure what that was all about, because if the memory is available, the program is supposed to just create the drive off the bat. It's not that simple. It has to be 6 GB of continuous memory (not fragmented) which is the case after reboot. After a while RAM becomes fragmented and the system may not be able to allocate a continuous block that is large enough to hold the entire RAM disk. Allow me to fallow up on this: Having gotten used to the idea one must simply reboot should they see this error, I preceded to do so, and received a BSoD 0x1E. OK: I'd gotten that once before from this app; I tried editing a disk, after using the "move the temp directory" tool (love that! ), and with no page file on it, I grew a 4GB up to 6, and it blew up 0x1E right then and there. The 6GB disk I wanted was there, waiting for me, after the reboot. Unfortunately there isn't much we can do without a memory dump. If possible, could you please do the following? BlueScreenView won't be of much help. SoftPerfect needs to analyze your kernel memory dump files from C:\Windows\memory.dmp. Hi all, I am also getting this error. I want to create a disc 21 Gb size and I get Error C000009A. Empirically calculated without error I can create ram disk up to 2300 MB. When I add a disk larger than 2300 Mb, I get the message: Error C000009A. Then I tried to create a disk size of 21 GB in the program Passmark OSFMount. Disk created successfully. 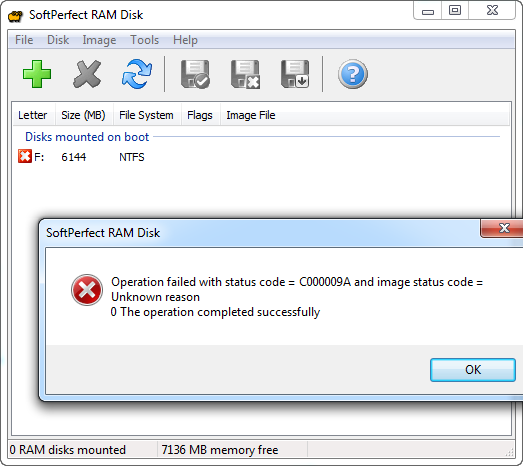 SoftPerfect RamDisk is wonderful program, but that is where the error occurred. If you need I can give remote desktop to my PC. e.g. via teamviewer. I am aware of the age of this thread, but am posting here because I have the exact same issue. I have 16gb of ram, and need to make a 4gb ramdisk in Windows 7 64-bit. This worked for me for over a month with SoftPerfect RamDisk, but now when I try and create/mount the disk, I get the same error as everyone else in this thread. We do support the product, but we've been unable to reproduce this issue. If we find a solution in the future, we will definitely release a new version that fixes the problem. Error C000009A means insufficient system resources, which typically indicates an out-of-memory condition. It's not necessarily low memory, for example, a similar error would occur if there was no continuous 4 GB block of RAM due to memory fragmentation. I would recommend to increase the size of pagefile to give the system more resources or decrease the size of the RAM Disk. Perhaps also consider what other software you have installed recently that may have caused resources shortage, since you had no problems before. As explained above, error C000009A means insufficient system resources, which typically indicates an out-of-memory condition. It is not necessarily low memory; for example, a similar error would occur if there was no continuous suitable block of RAM due to memory fragmentation. Please make sure you are using the latest version of the RAM Disk. I also recommend to increase the size of pagefile to give the system more resources, and decrease the size of the RAM Disk. Hello, I also have the problem with the error message. Have 32 GB Ram and have always worked with an 8GB RamDisk. Then all at once came the error message ( Error C000009A ). Then I played around with the size of the RamDisk and found that the error only occurs from a size larger than 4000 Mb. If I specify 4096Mb then the error occurs. Please try with the latest version (4.0.7). In particular we've improved memory allocation strategy in v4.0.5. Oh sorry, I forgot to state that use 4.07. A restart does not solve the problem.